Simple sophistication. 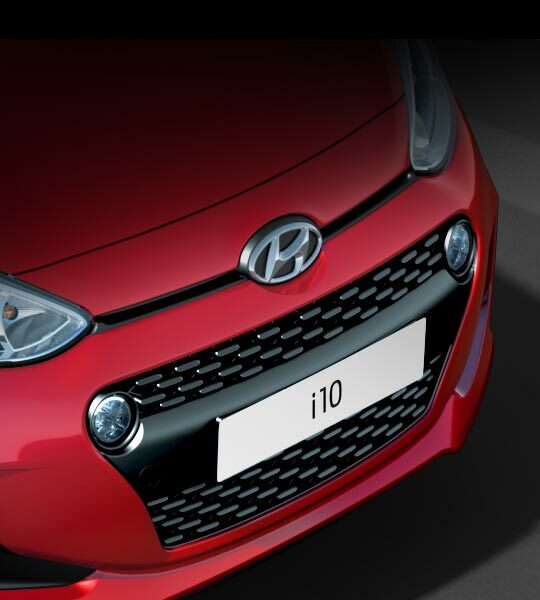 Everything about the New i10 makes a clear, confident impression. 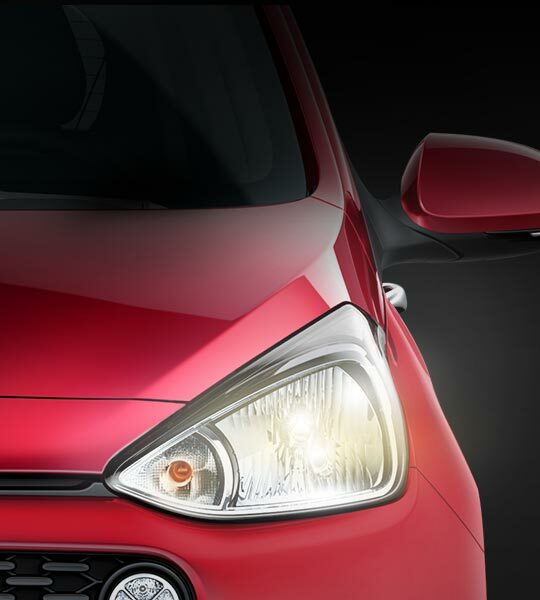 Headlights The sleekly styled headlights add to the overall dynamic looks of the New i10. Cascading grilleThe newly designed grille adopts the cascading profile that reflects the latest Hyundai design direction. 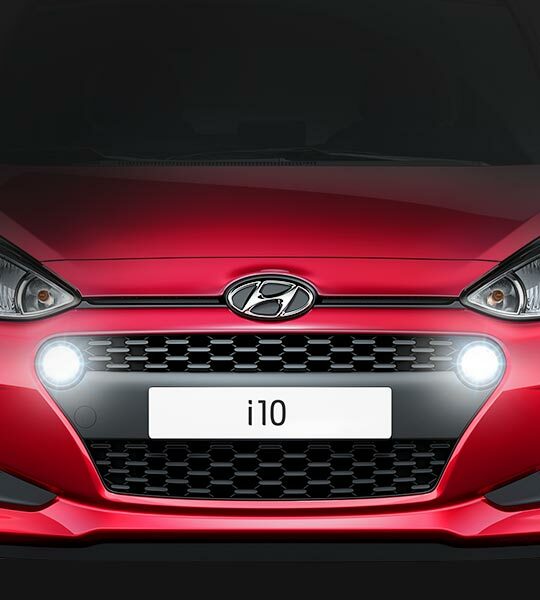 New, round daytime running lights Round daytime running lights add a touch of sportiness to the front of the New i10, with powerful and efficient LED versions available on Premium and Premium SE models. 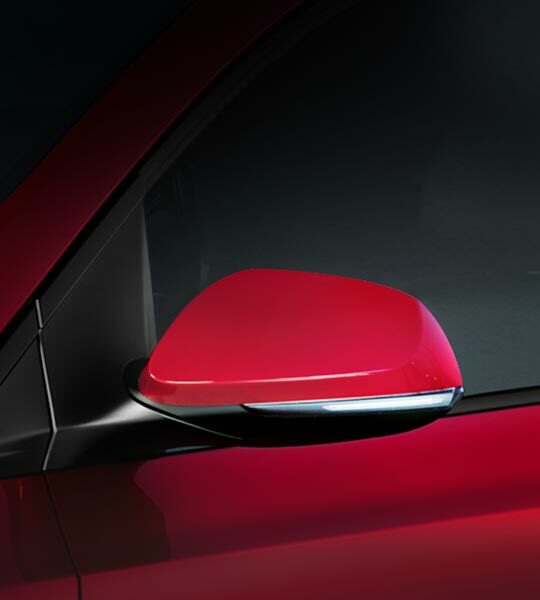 Door mirror LED indicators Available on Premium and Premium SE models, LED indicators are cleverly integrated into the door mirrors, making it easy for other road users to see when you’re making a turn. 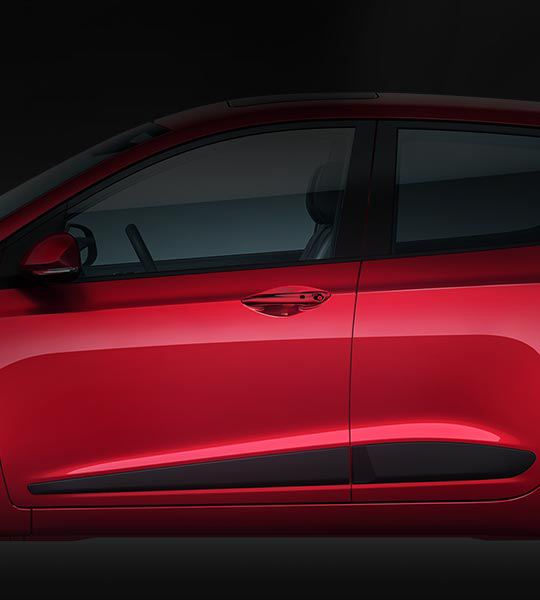 Sleeker side mouldingsThe side mouldings on the New i10 have been restyled to create a sleeker, more dynamic impression. Wheels A range of wheels in sizes up to 15” are available dependant on model. 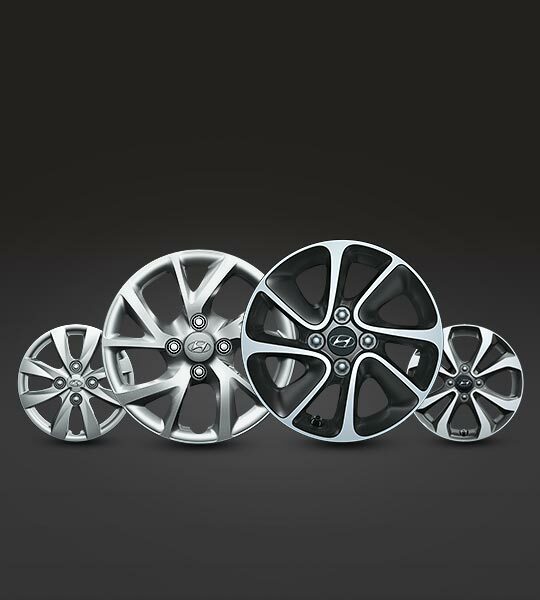 These include newly designed 14” sporty alloy and 14” steel wheel covers. 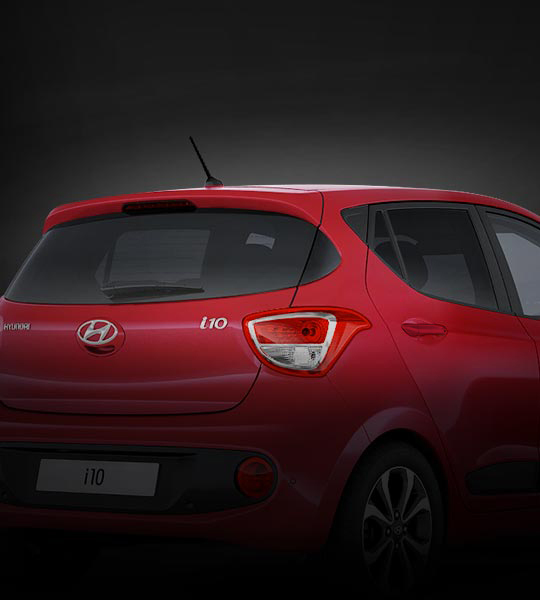 New rear bumper with contrasting insert Setting the New i10 apart from the crowd is the sculpted rear bumper incorporating a black panel and new round rear fog lights. 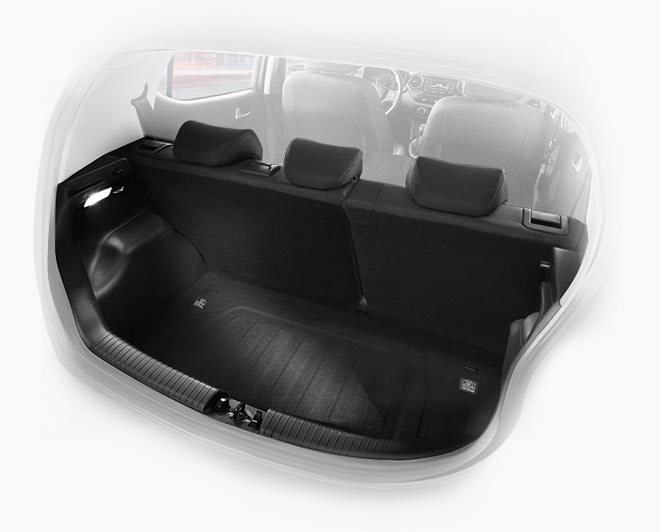 Privacy glassDarkened glass in the rear side doors and rear window of Premium and Premium SE models offer a touch of sophistication, as well as privacy for rear occupants and relief from strong sunlight. 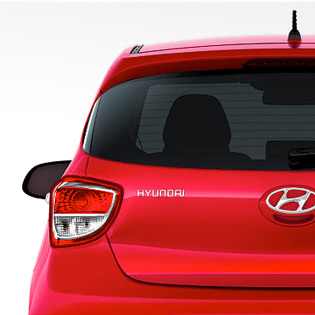 Rear combination lightsMake a strong impression with rear combination lights that express both stance and style. 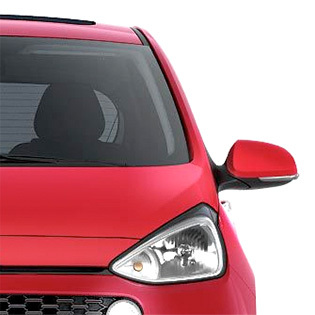 The new projection fog lights are ideally positioned low in the bumper to provide better vision in foggy conditions. 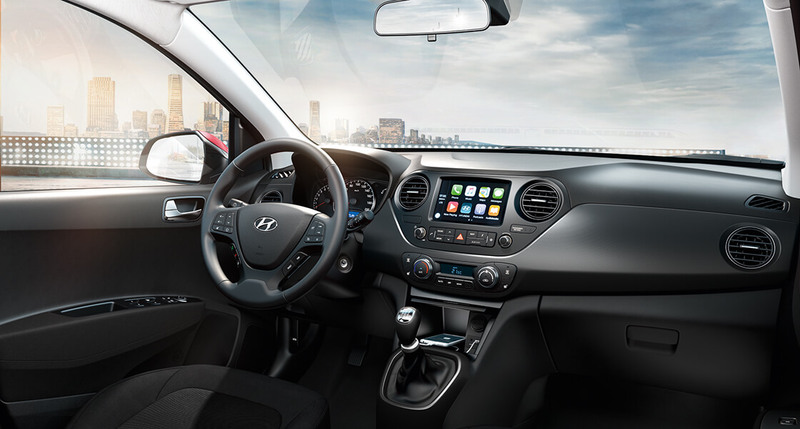 Premium SE models feature an electric tilt and slide sunroof which allows more fresh air and light into the cabin. 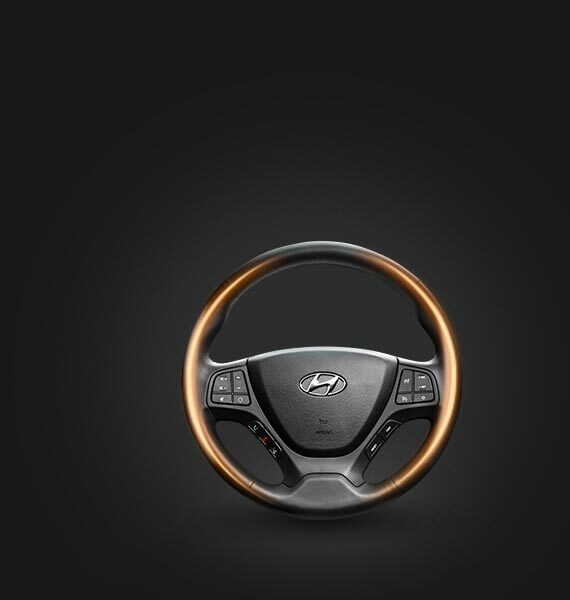 New i10 an impressive all round advantage. Express your own style with your choice of interior décor. 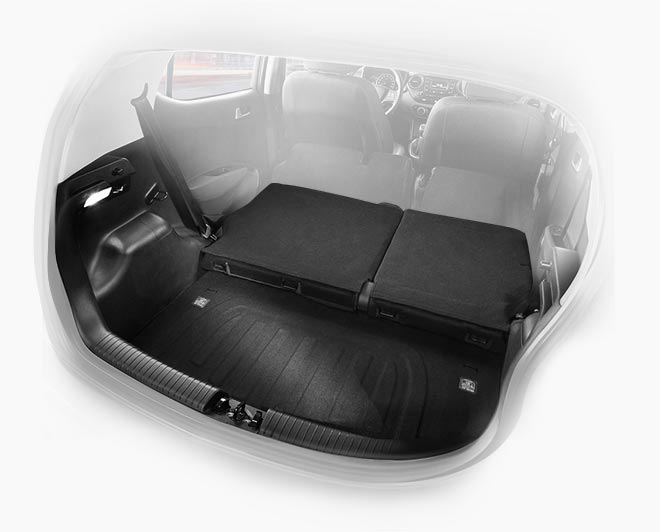 Plenty of space to accommodate whatever you need to carry. 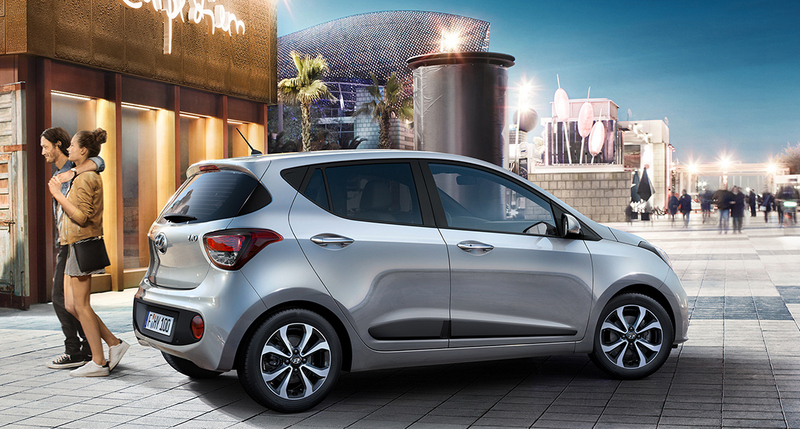 Together with its class-leading cabin space, i10 boasts one of the largest boots in its class. 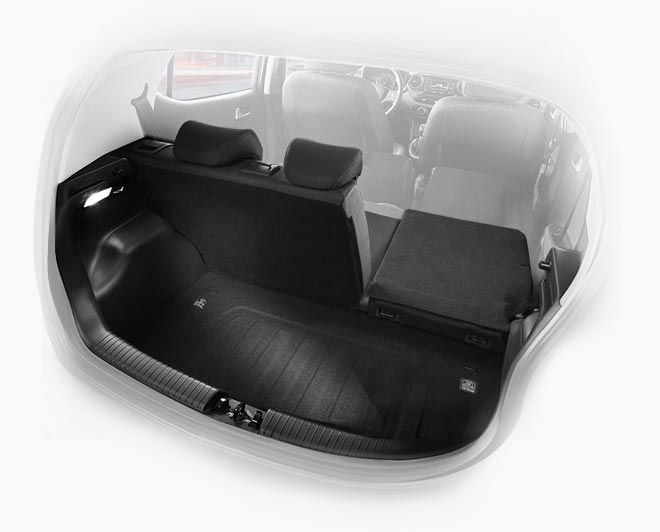 The luggage capacity of up to 252 litres dependant on model, expands to 1,046 litres when the rear seats are folded down. 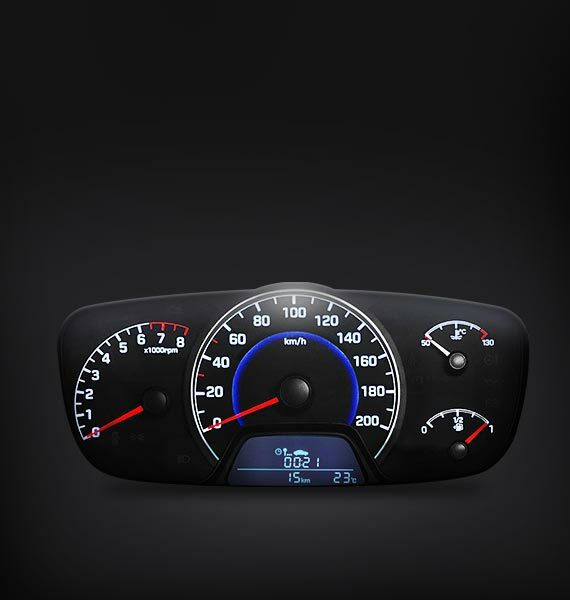 The extremely clear instrument panel displays important driving information. Invaluable on cold winter mornings, the heated steering wheel on Premium SE models helps you start your day the right way. 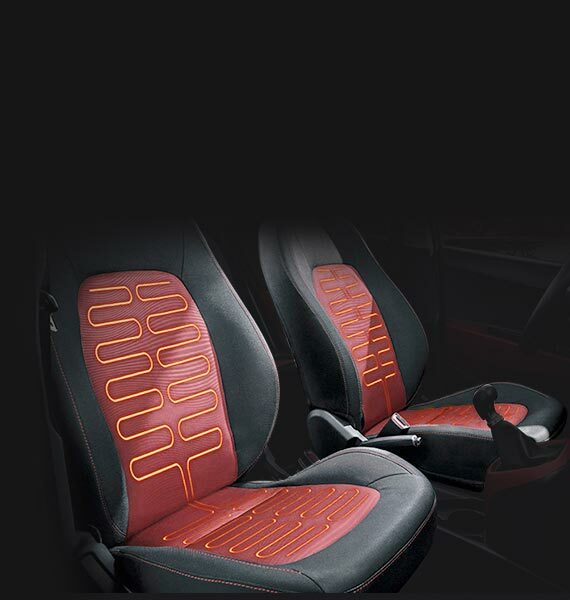 Choosing the Premium SE model means you can enjoy the luxury of heated front seats with 3 different intensity settings. 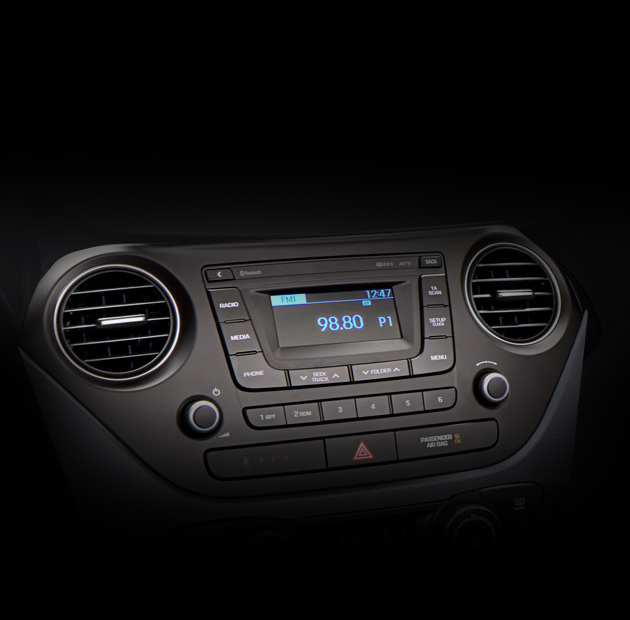 It’s easy finding what you’re looking for with glove box illumination, available on Premium and Premium SE models. Who says the boot needs to stay dark? Luggage lights automatically turn on when the boot opens and are available on SE models and above. Safe, secure places to keep your favourite drinks when you’re on the go. 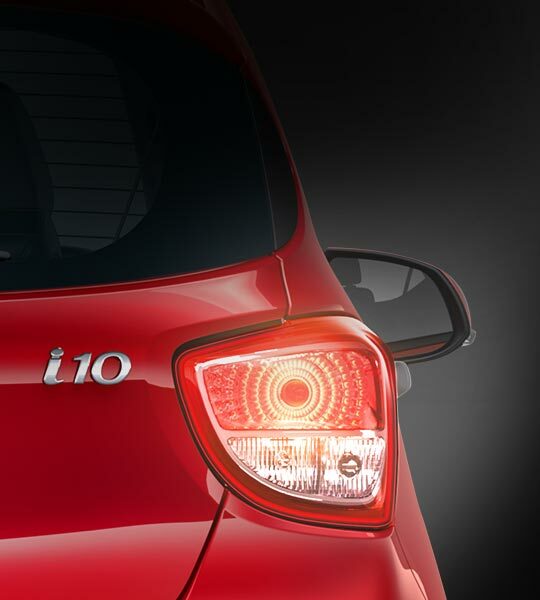 Whatever the length of your journey, you’ll appreciate the attention to detail that’s inside the i10. 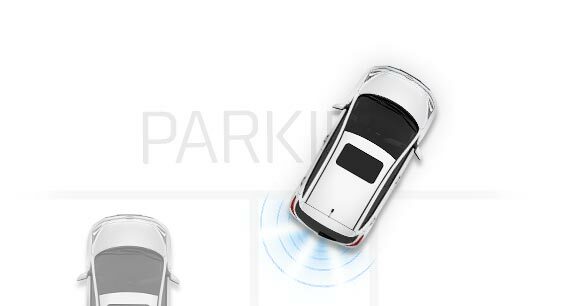 Rear Parking Sensors Reversing into confined spaces can be a problem, especially in low visibility conditions. 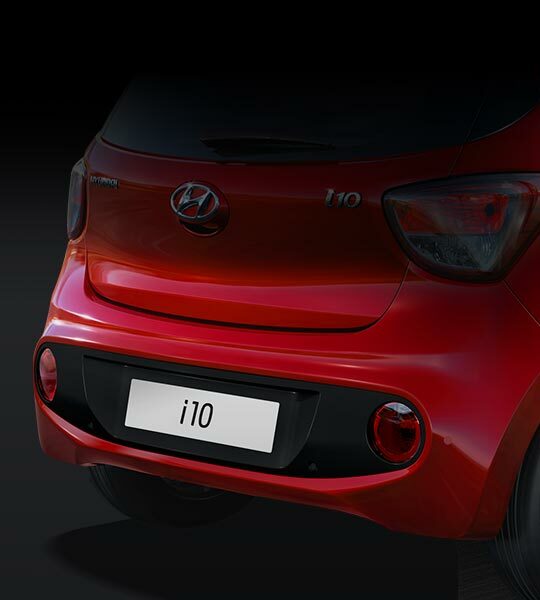 The New i10 Premium SE has four sensors in the rear bumper that can detect obstacles you can't see, and tells you when to stop reversing. 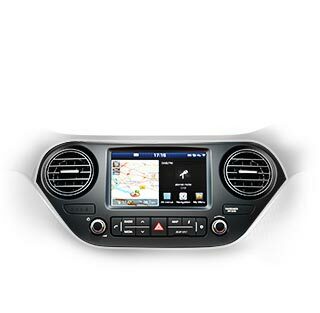 NavigationThe 7” LCD touch-screen* shows more than just route guidance. 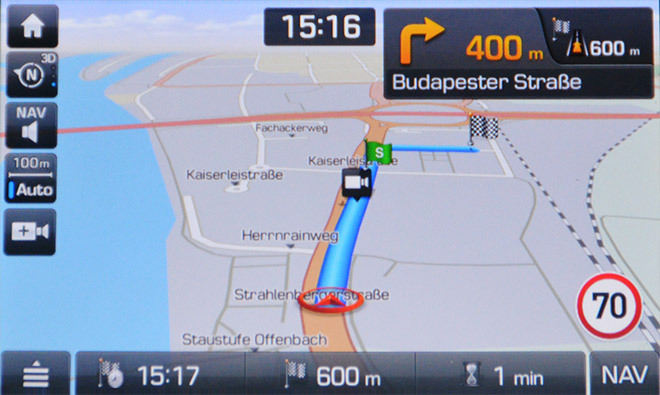 The navigation system’s LIVE Services also provide up-to-date traffic information, speed camera alerts, weather and points of interest. 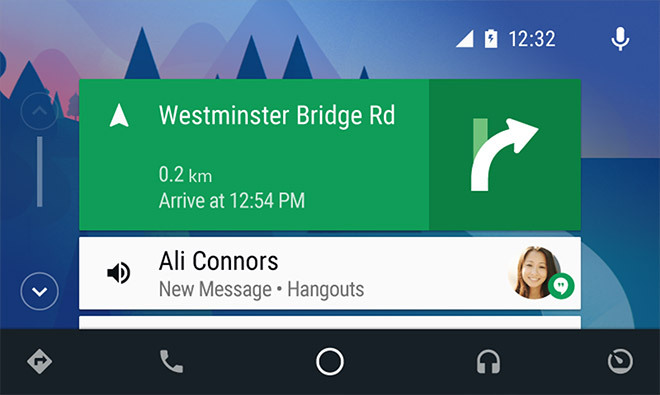 Thanks to Apple CarPlay** and Android Auto**, your compatible smartphone can also be perfectly integrated. 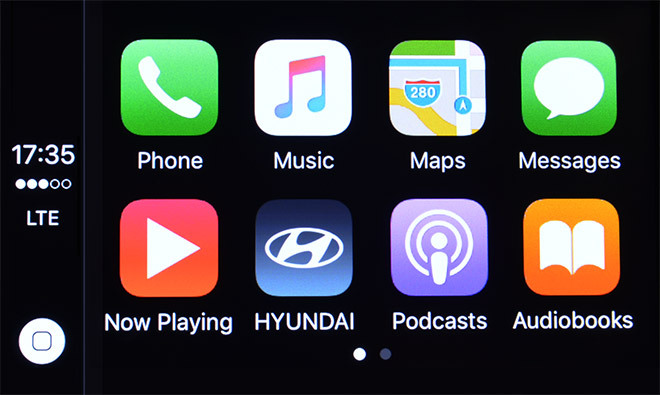 ** Apple CarPlay™ is a registered trademark of Apple Inc.
DAB digital radioThe new audio system available on SE models and above includes the crystal-clear digital sound quality of DAB radio. Steering wheel remote controls The multi-function steering wheel on SE models and above lets you operate your audio, phone, cruise control and trip computer without taking your hands off the wheel. 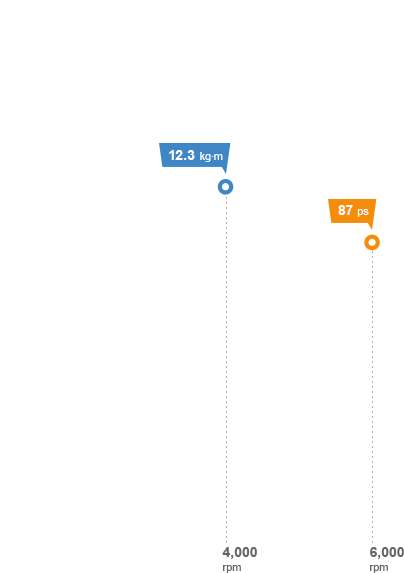 The steering wheel can be adjusted for height. 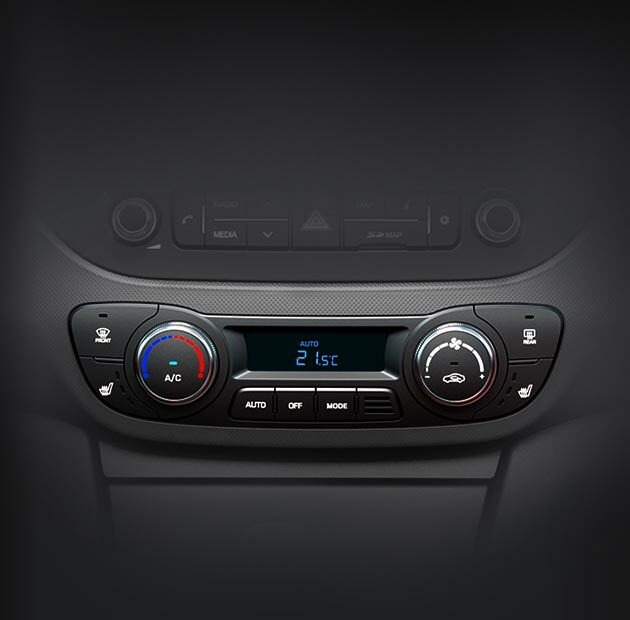 Fully automatic air conditioning system No need for fiddly adjustments thanks to climate control on Premium and Premium SE models. Just set the desired temperature and the system does the rest. 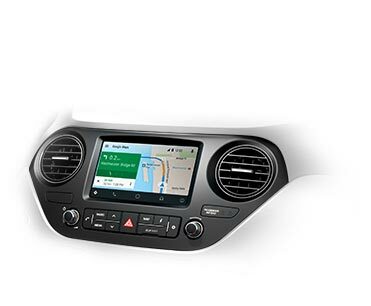 SE models and above offer Bluetooth® connectivity. 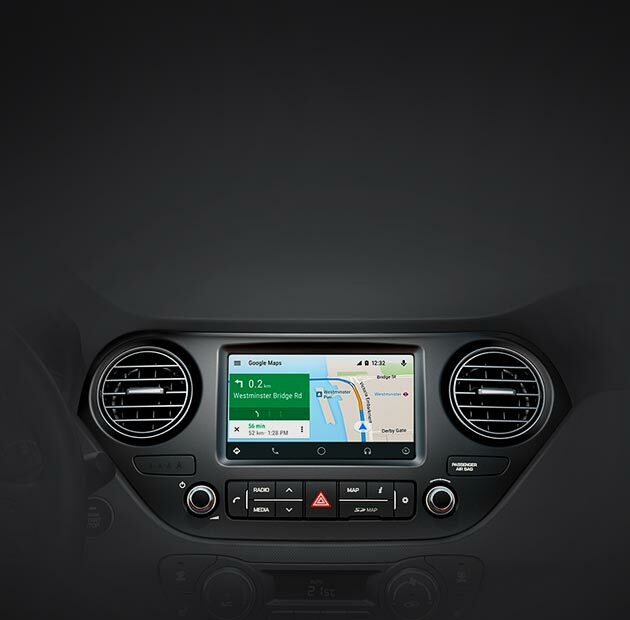 Controlled from the steering wheel, you can access your favourite music via audio streaming and make calls, all without lifting a finger. The Bluetooth brand is the property of Bluetooth SIG Inc.
Easy connectivity for your iPhone, iPod or other device, just plug-in and play. iPhone and iPod are trademarks of Apple Inc.
Access Premium SE models without needing to have the keys in your hand. A touch of the start / stop button when you’re inside is all it takes to get going. 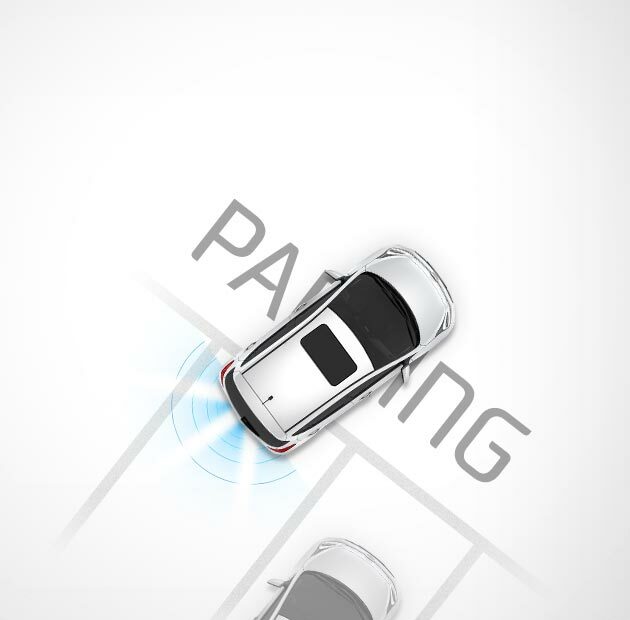 Optimised chassis settings provide enhanced ride, handling and steering feedback. 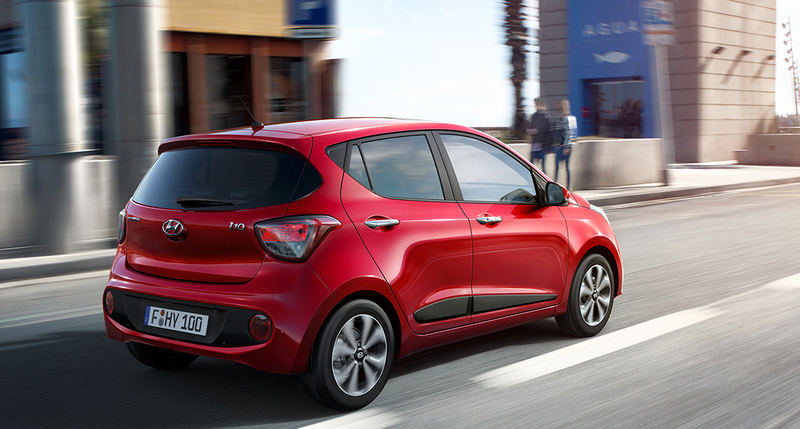 And the New i10 powertrains let you make the most of every drive, whether winding through country lanes or cruising on the motorway. The 1.0 petrol engine delivers maximum power of 67PS at 5,500 rpm and maximum torque of 95 Nm at 3,500 rpm. The 1.2 petrol engine delivers maximum power of 87PS at 6,000 rpm and maximum torque of 120 Nm at 4,000 rpm. The gear stick is ideally located for fast, precise gearshifts. 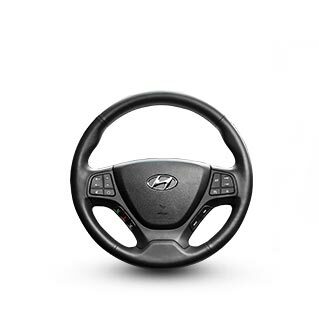 Smooth automatic shifting for a more relaxed driving experience. 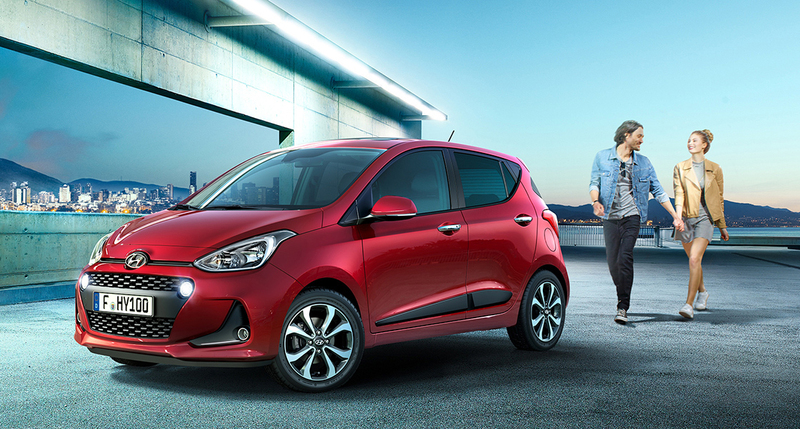 Advanced driver assistance technologies work together to help keep the New i10 on track and out of trouble. 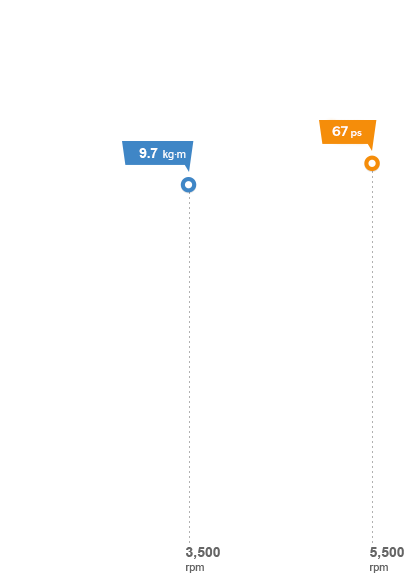 Electronic Stability Control (ESC) and Vehicle Stability Management (VSM)Stay on the road with standard Vehicle Stability Management (VSM), which takes into account everything from the traction value of each wheel to how the body of New i10 is behaving. 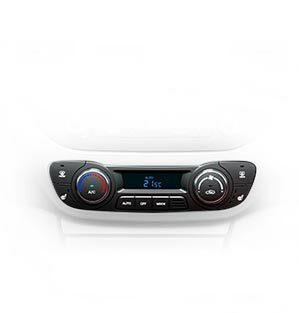 And rest assured with the standard Electronic Stability Programme (ESP). 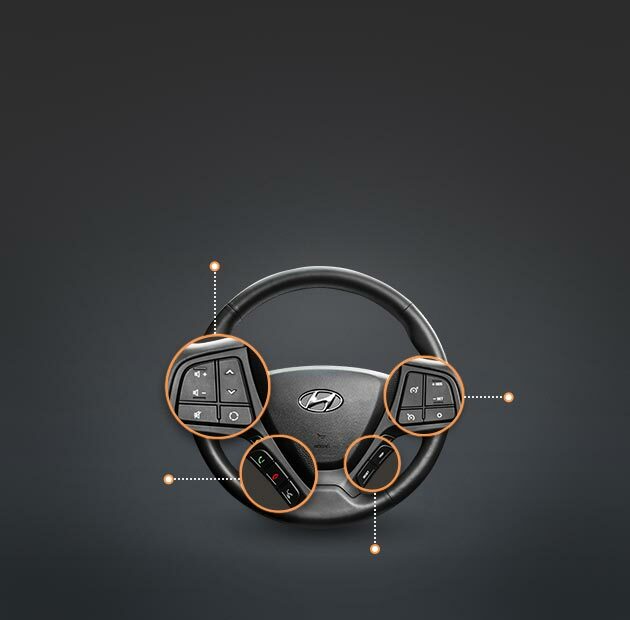 It'll detect when you need to brake, whether it's during sudden movements or sharp turns, to keep you stable. 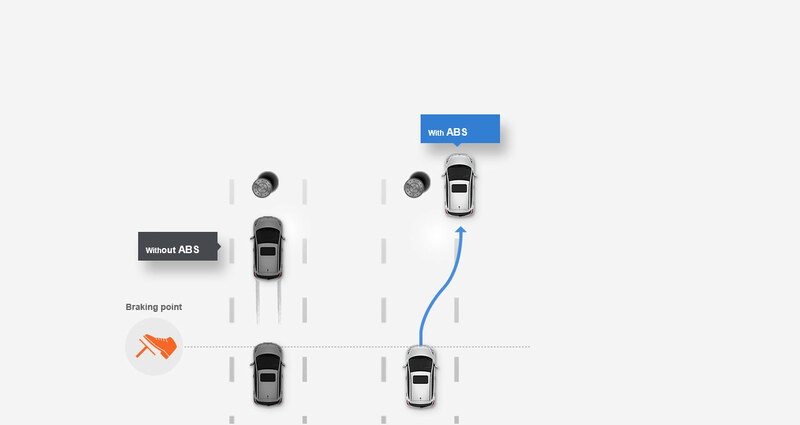 Anti-lock Brake System (ABS) and Brake Assist System (BAS)ABS helps to maintain steering control under emergency braking conditions. BAS adds extra braking effort to maximise braking performance. 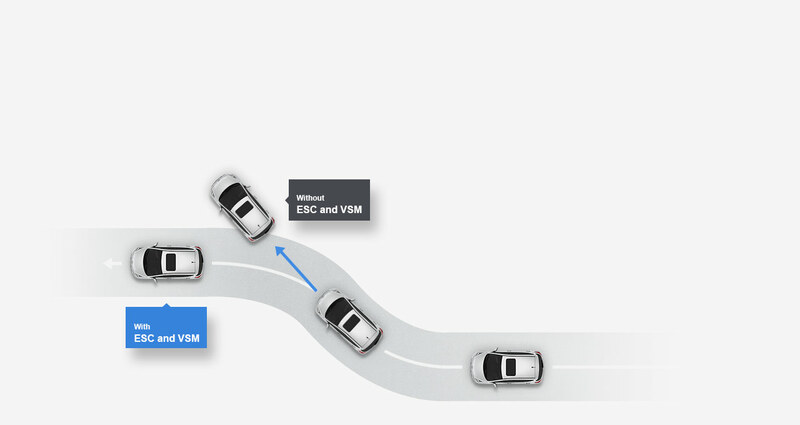 BAS adds extra braking effort to maximize braking performance. 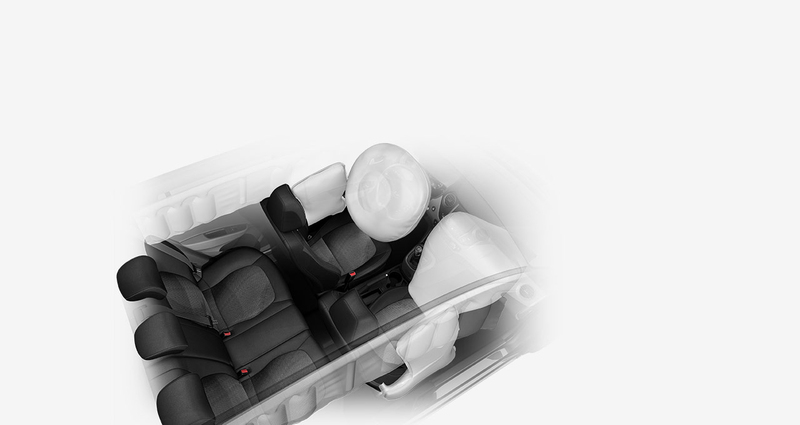 6-airbag systemEvery New i10 offers peace of mind with six airbags that are deployed on impact to protect all occupants. 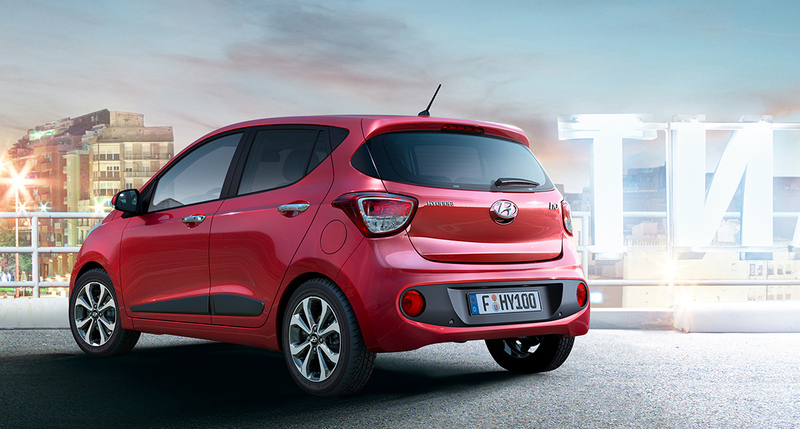 For extra stability and practicaility, the rear seats in every New i10 feature an ISOfix child seat anchor.